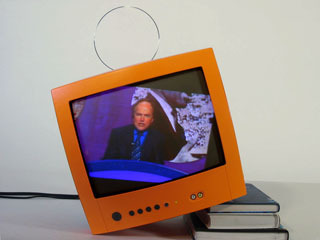 OiTV is a television set that occasionally misbehaves. Sometimes it autonomously changes the channels, other times it moves or rotates the image out of its screen. Glitches and lapses in time occur as much as playback of the live broadcasted content being slowed down, fast forwarded or rewind. How do you treat a domestic object that doesn’t quite do what you want it to do? Does adjusting the antenna help, or possibly moving or tilting the object? Is hitting the TV in good old-fashioned manner the way to go or do you rather stroke it gently? OiTV explores user behaviours outside the realm of prescriptive manuals. It does not fulfil the common aspiration for the perfectly working product / technology. Its erroneous and comical behaviour rather tempts you to build up a more individual and possibly even affectionate relationship with a domestic object charged with character and attitude.